TDS Equipment is owned and operated by Tom and Dana Wood. Tom has over 20 years of experience in working with equipment dealerships in the logging and construction industry and has watched the evolution of logging from chain saw and skidders to fully mechanical, feller bunchers and stroke delimbers. Tom also has the experience and reputation to repair and modify equipment to make it more efficient or customize it to a particular operation to meet the customers need. 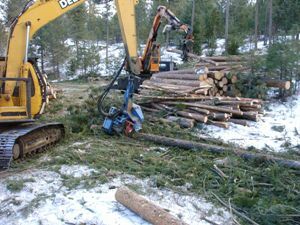 TDS Equipment specializes in CUSTOM ATTACHMENTS and equipment involved in fuels reduction for forestry work. We are located in the United States at Hermiston Oregon. Our business is well known for the way we rebuild equipment. Many pieces of equipment are disassembled and reconditioned. All parts not meeting specifications are replaced with new or rebuilt components. TDS Equipment has sales and rentals in the United States (OR, WA, ID, CA, MT, WY, CO, NM, ND, NJ, TX, and IA) Customers are contract loggers and construction companies, equipment dealers, equipment importers, equipment distributors, John Deere Company and US Forest Service. We have quoted jobs in most states in the US, Virgin Island, Canada, Japan, Germany and Australia.